What they want is to get what they want. Gift cards are available in any denomination from $10 to $1,000. Redeemable at jpcycles.com, by phone, at J&P Cycles retail stores or mobile showroom at events nationwide. How much on the card? Note: E-Gift Cards must be purchased as a single transaction. If there are items in your cart, they will not be included in this transaction. The items in your cart will be available to purchase once your e-Gift Card transaction is completed. Where can the e-gift card be used? 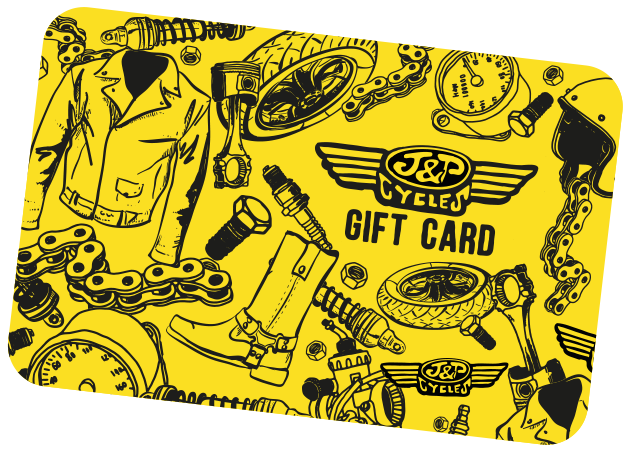 The e-gift card can be used at any J&P Cycles retail location, by calling our Customer Service 800-397-4844, or online. What does the recipient receive? The recipient receives the gift card in the form of an email. It is immediately available for use. When is the e-gift card sent to the recipient? Once the customer's order has been processed and the credit card has been charged, the e-gift notification is sent immediately to the customer and recipient. Will I receive a gift confirmation? Once you complete your order you will receive an order confirmation verifying that your gift card purchase is completed. You will also receive verification that the recipient email has been sent. Does the e-gift card expire? No, there is no expiration date for an e-gift card. While gift cards never expire, we are required by some state laws to remit any unused portion of gift cards to State Escheat Programs after 3 years. Are the e-gift cards reloadable after the full value is spent? What happens if the recipient does not receive the email? Have the recipient check their spam filter. If they still have not received it please contact customer support through chat, email, or by phone at 800-397-4844. Can I purchase an e-gift card for myself? Yes. When purchasing online, add your own name and email in the recipient information and complete the transaction normally. When is the credit card charged for e-gift purchase? The credit card is charged at the time of purchase. This purchase will appear on your credit/debit card statement as JPCYCLES EGIFT. Can International Customers purchase e-gift cards? Yes, just follow the normal e-gift card purchase process. Can I purchase two (or more) e-gift cards to two (or more) different people who share an email address? No. Each e-gift card purchase needs to be placed as a single transaction. Does the e-gift card need to be printed in color? What if the e-gift card is lost? The e-gift card has cash value and should be safeguarded as such. If the printed e-gift card is lost, the customer should contact us immediately. If the e-gift card has not been redeemed or has some remaining value, we can cancel the original and issue a new e-gift card for that value. Can I refill my gift card? You may purchase a Gift Card online, by phone, or at a J&P Cycles retail location. Can I have a gift card delivered to my friend? What shipping options are available when I order J&P Cycles gift cards? Shipping options for J&P Cycles Gift Cards include: Standard, 1-day, 2-day, and 3-day. Expedited and International shipping is an additional charge. How soon will my J&P Cycles gift cards arrive? Your J&P Cycles Gift Card will arrive in 7 - 10 business days, depending on shipping method. How quickly can I use my card? As soon as you receive your J&P Cycles Gift Card, it is ready to use. How do I use a gift card at jpcycles.com? You may use your J&P Cycles Gift Card on the web, you will see this choice on your checkout screen; by phone, tell your sales representative that you have a J&P Cycles Gift Card; or at a J&P Cycles retail location or Mobile Showroom, simply present your Gift Card at the register. No, our gift cards do not have an expiration date. While gift cards never expire, we are required by some state laws to remit any unused portion of gift cards to State Escheat Programs after 3 years. Can I buy something that costs more or less than card amount? Yes. If your purchase totals less than the Gift Card amount you will have a balance on the card. If your purchase totals more, you simply pay the difference with another payment option. Where is my card number located? The card number is the 16- or 19-digit number on the bottom of the back of your Gift Card. Can I store gift card information in my account? No, we are unable to store this information. Can I pay with more than one gift card? Yes. Just present any number of Gift Cards for you purchase. Online use of Gift Cards is restricted to 15. Can I return or refund my gift card? Yes. It will be credited to the original form of payment. How do I activate a gift card? The Gift Card is activated when you receive it. There is no procedure required. You can check it online by clicking the link at the top of this page, by calling the 800 number on the back of the card, or presenting it to a sales associate at a J&P retail location. What if my gift card has been lost or stolen? We're sorry, but a Gift Card is just like cash, so keep it safe. If you lose your Gift Card, we cannot replace or refund the money. What can I buy online with J&P Cycles gift cards? Any product on our website, except other Gift Cards or Gift Certificates. Do I need to keep my gift card after I've used it? No, but we recommend keeping it until you receive your order placed using the Gift Card. Do dormancy fees apply to J&P Cycles gift cards? Dormancy fees do not apply to J&P Cycles Gift Cards. Gift Cards are not taxed when purchased, however shipping and handling charges for purchases made may be subject to sales tax. Any applicable taxes will be charged when the gift card is redeemed. You may use your J&P Cycles Gift Card one the web, you will see this choice on your checkout screen; by phone, tell your sales representative that you have a J&P Cycles Gift Card; or at a J&P Cycles retail location or Mobile Showroom, simply present your Gift Card at the register. May I reload a gift card? No, we prefer you to just purchase a new one. What if I already have a gift certificate? You may redeem Gift Certificates online, by phone, or at a J&P retail location. How quickly is a gift card activated?